The tape starts with Plant mentioning that this is the band's last night in San Francisco. The beginning of Train Kept a Rollin' is met with shouts of "yeah! yeah!" from one excited audience member. Plant adlibs new lyrics about San Francisco during I Can't Quit You Baby. As the song ends, there is a pause while Bonzo repairs his snare drum, during which someone in the crowd requests You Shook Me. What follows is an As Long as I Have You of epic proportions. The first version of this song I ever heard and still my personal favourite, it has definitely developed into a major centerpiece of the live show. A perfect venue to showcase the improvisational abilities of each member of the band. Plant's voice is a bit rough around the edges during You Shook Me, but his harmonica solo is bluesy and dynamic. How Many More Times is one of my personal favourite performances. The atmosphere is loose and lends itself to some excellent and very interesting improvisation. There is an amazing funky groove immediately following the bow solo. The "got you in the sights..." section includes an excellent heavy jam, complete with some strange lyrics from Plant (apparently trying to get around singing the final "gun!"). The first set ends with a mid-show encore of Communication Breakdown as requested by someone in the crowd. The second set starts with a loose and funky Killing Floor, including new lyrics from Plant, whose voice seems to get rougher as time goes by. A somewhat subdued Babe I'm Gonna Leave You is followed by White Summer/Black Mountain Side. Sitting and Thinking is played as a loose blues improvisation. Someone in the crowd shouts for Pat's Delight before Plant introduces Bonzo. The drum solo itself is rather dull. The show ends with a somewhat sluggish Dazed and Confused. Despite the subdued second set, this is definitely a must hear. No collection is complete without this show. The tape is an excellent soundboard recording with a slightly muffled audience recording filling the gaps. Collage is a straight repro of a FBO tree called "The Jimi Page Experience". What FBO did is combine the AUD and SBD to make 1 definitive version. Doesn't matter what version you have this is worth tracking down. 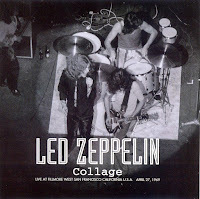 1969-04-27 Fillmore West, San Francisco, CA "The Jimmy Page Experience"
Version is mostly soundboard with audience patches to complete the show. Starts of with audience source with The Train Kept A Rollin', listenable, but in short order the Soundboard source kicks in, and things improve quite a bit. Plant's voice stands out above the rest, but everything is easy to hear. Plant improvises different vocals for I Can't Quit You, and then what has become my favorite of these early shows, As Long As I Have You. This version is about 20 minutes long, the band is really starting to stretch out this song. You Shook Me is next, sounds a bit slower than normal. You Shook Me and then an extended How Many More Times. The quality gets a bit worse for a bit during HMMT, but then it comes back for Communication Breakdown. It almost sounds like the gang are running out of steam during the second set, just not as energetic - but early Zeppelin on a somewhat laid back night is still pretty darn good. Second set runs through Killing Floor, Babe I'm Gonna Leave You, White Summer, a decent version of Sittin' and Thinkin', Pat's Delight and wraps up with Dazed and Confused. The quality drops a bit here and there, but overall the show is of very good quality and is worth listening to again. The first bootleg that I ever listened to unaltered. This is what got me hooked as far as Led Zeppelin bootlegs count. Listening via Avocado Club and generally agree with the review on this one. Personal highlights are "As Long As I Have You," "How Many More Times" with it's extended jam and the frantic "Communication Breakdown," which also features a cool bluesy jam. "Sittin' and Thinkin'," despite its novelty is a shaky performance, "Pat's Delight" is tedious and too long - dig the riff though. "Babe I'm Gonna Leave You" is very loose, Page wandering around the song's basic motifs - interesting but easy to see why this track did not last as a live staple. The sbd portion is at times excellent, but the constant adjustment of instrument levels and back and forth stereo panning is annoying and distracting to the enjoyment of this show. Worth having for the standout performances and overall good quality of the recording. Is anyone out there?? I gotta know if there is a version of Killing Floor w/out the major cut at 1:39?? Just to mention the remasters went public today with the companion discs. . cant wait. . LONG LIVE THE ZEP!!! Page is indescribably powerful on "You Shook Me". Beyond epic.